iOS 9 is set to make your iPhone a lot smarter with automatic suggestions that pop up before you can even ask to see a specific app or bit of information. Unfortunately it doesn't look like Apple is changing its lockscreen to match, but one former Apple employee has a pretty smart idea for how that might look. 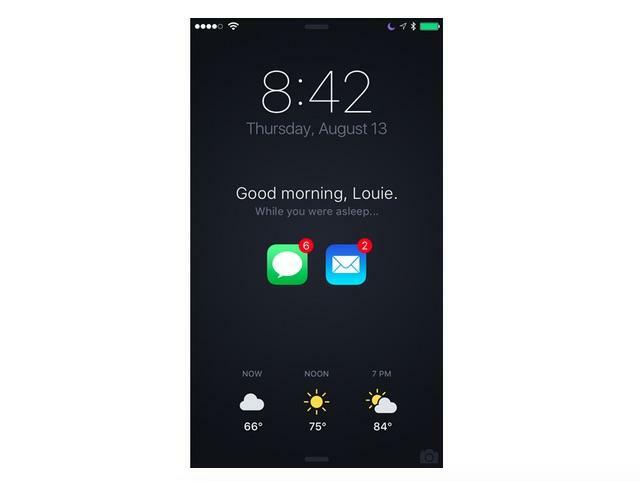 Created by Louie Mantia, this concept design offers a smarter and simpler take on the lockscreen for iOS. Notifications are grouped by app instead of getting thrown together in a single long list. You'd also see the daily weather report along the bottom of the screen. Finally, your iPhone even knows you just woke up and offers a friendly "Good morning" greeting. We're guessing that message, along with the weather widget, could change depending on time of day and other contextual data. Mantia actually worked at Apple as a designer for iTunes before leaving in 2011. That doesn't mean Cupertino will pay any more attention to this idea than it does the countless other concept designs created every year. Still, hopefully someone at Apple sees this and takes it into consideratio. Of course, it's way too late to include what Mantia is proposing in iOS 9, which is already available in beta and expected to get an official launch next month. But once Apple starts working on iOS 10 it may want to take a good look at this concept for improving the lockscreen.